A Member recalls from his ‘spotting’ books. In 2014, longstanding EUROPLATE Member JOHN PEMBERTON EU 083 kindly passed his logbooks for the years 1955-1998 for inspection by EU 038 Vic Brumby. A year’s analysis of John’s handwriting and his many amazing sightings are now complete (though may never be finished in the total detail) and are attached here for the scrutiny of our Members. Only about 2% of John’s book-sightings have been selected for this précis, chosen on the basis of their perceived interest to historians. You will note how varied and exotic are the sightings from the earlier years, when great ships crossed the globe, carrying cars and people to and from their overseas jobs with colonial territories and other developing nations, such as the USA. That group, and the diplomats and the early Aid organisations, usually brought their personal vehicles back with them on the ships at the end of their tours of duty, and they could circulate in their home country for up to a year, on the foreign plates, as they waited for their next postings. The 1940’s, 50’s and 60’s were perhaps the most fruitful years for international car movements. Car hire was in its infancy, as was air travel, and until those became commonplace, there were few fundamental changes to the plate-enthusiasts’ great days out in the capitals and great dock cities of the day. John notes sightings from all over the U.K., though mostly from London. and Grenada P 2734 below. These pictures are noted within the spreadsheet with pink-coloured background lines. 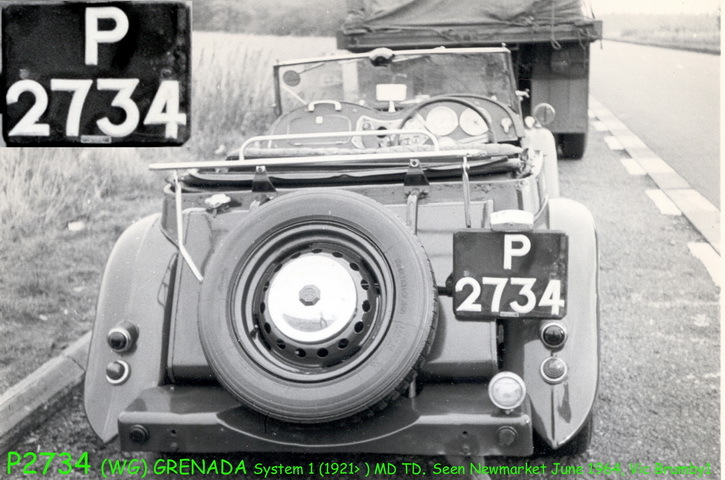 P 2734 was a rare Grenada (WG) plate seen by EU 0038 on this MG TD near Newmarket in June 1969 , and (without photo) noted by EU 0083 in July 1969. Oct.7, 2015. Already some corrections have been advised and incorporated in to the latest version of the spreadsheet. This entry was posted on Sunday, October 4th, 2015 at 6:26 pm and is filed under DATA lists. You can follow any responses to this entry through the RSS 2.0 feed. You can leave a response, or trackback from your own site.